Cholelithiasis is also known as gallstones. There are few form of gallstones which include cholesterol stones and pigment stones or a mixture of cholesterol and pigment stones. The gallstones are form based on the facts that the bilirubin and cholesterol level overwhelm solubilizing lecithin and bile acids in the gallbladder. Generally, the common caused of gallstone as a whole is over 40 years old female who is obese and multiparous. 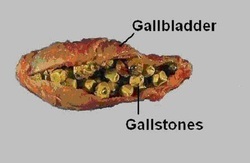 Specific caused of gallstones are describe further based on the cholesterol stone or pigment stones. Cholesterol stones mostly present in older people, native american heritage, multiparity, obesity, cystic fibrosis, estrogen intake, Crohn’s disease and clofibrate used with rapid loss of weight. Cholesterol stones may appear radiolucent ( in certain cases due to calcification cholesterol stones may appear radio opaque.). Pigment stones may associated with older age, hemolytic anemia, alcoholic cirrhosis and infection of the biliary tract. Pigment stone is radio opaque as it consists of pigment of biles. Mixed stone which consist of cholesterol and pigment stone may appear radiolucent. No treatment is required if the patient is asymptomatic. Treatment such as cholecystectomy may be required if the patient appeared to be symptomatic. The symptoms and signs of cholelithiasis include charcot triad. Charcot triad consists of spiking fever, colicky epigastric and right upper quadrant pain after fatty meal and jaundice. The complication of the cholelithiasis are cholecystitis, ascending cholangitis, biliary colic, acute pancreatitis, obstruction of the common bile duct gallstone ileus and gallbladder adenocarcinoma. 1.Schirmer, Bruce D., Kathryne L. Winters, and Richard F. Edlich. “Cholelithiasis and Cholecystitis.” Journal of Long-Term Effects of Medical Implants 15, no. 3 (2005): 329–338. doi:10.1615/JLongTermEffMedImplants.v15.i3.90. 2.Schirmer, B D, S B Edge, J Dix, M J Hyser, J B Hanks, and R S Jones. “Laparoscopic Cholecystectomy. Treatment of Choice for Symptomatic Cholelithiasis.” Annals of Surgery 213, no. 6 (June 1991): 665–677.